Wellness Gift Vouchers | Mahlerův Penzion "Na Hradbách"
Do you bother with choosing a gift for your husband, girlfriend, colleague or married couple? You can pass on an unforgettable experience of a luxury Wellness center in form of a Gift Voucher. Celebrate with a relaxing champagne and candlelight dinner every exceptional event. An unforgettable experience of the luxury Wellness Center can be handed over to your nearest in form of a Gift Voucher. Celebrate every special event with relaxation with seclusion and candlelight dinner. 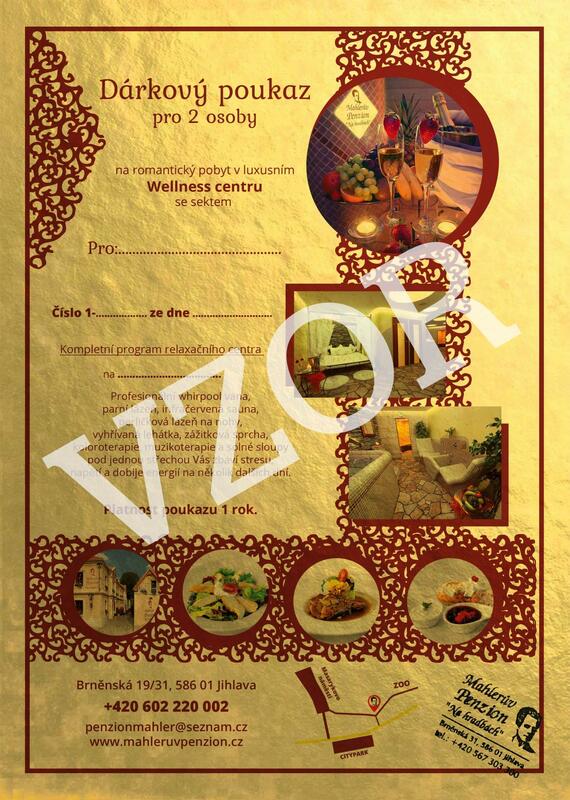 Gift vouchers to the Wellness Center are for sale at the reception of Mahler's guesthouse "Na Hradbách". The voucher is pre-printed on a beautiful A4 size gold paper. The receptionist will write the date of sale and you will have (the endowed) year to make the reservation. address of Mahler's guesthouse "Na Hradbách"
Date and time of stay in Wellness Center must be agreed in advance. Eventual CANCELLATIONS of booked reservations must be announced well in advance. The price of the envelope itself is 50,- CZK. This amount is not included in the voucher itself. When sending a voucher by post, we charge another 100 CZK.